Dangerous dust: Control measures during concrete testing - Sentry Air Systems, Inc. While the term ‘concrete jungle’ is commonly used to describe buzzing downtown urban areas, concrete is a major player throughout our global infrastructure. Concrete is used in many residential and commercial applications, from home construction and commercial skyscrapers, to roads, highways and large diameter pipeline. In fact, our safety is dependent upon how strong concrete is, which is why rigorous testing is so critical. Just imagine what would happen if no one tested the durability of the concrete being used for a 10-story overpass! Three of the most common tests performed on concrete are: Slump, Air Content and Compression Strength. A slump test measures the consistency or workability of fresh concrete for a specific batch. Measuring total content of entrained and entrapped air in concrete is important because a certain mix of air can prevent damage during freezing and thawing conditions. For the purposes of this article, we are focusing on compression strength testing (which is arguably the most important). Testing the compressive strength of fully cured concrete samples determines whether a product meets specified strength requirements, when to strip forms, and when a product is ready for shipping and service. To conduct compressive strength testing, a sample concrete cylinder is placed in a compression-testing machine where a constant and increasing load is applied until the cylinder breaks; thereby measuring the amount of force it takes to break the sample. Several videos are available online that show a compression strength test in action (see resources section). The force of the break causes heavy debris to project into the surrounding area. To protect operators, cages and screens are sometimes used around the test chamber. What is hard for workers to escape from is the plume of concrete dust that becomes airborne. The basic components of concrete include: air, water, cement, aggregates, chemicals and supplements. When these materials are in a fine dust-like state, they pose respiratory health concerns when inhaled. In general, short term exposure to high levels of cement dust may irritate the nose and throat while long term exposure may lead to occupational asthma. Inhalation of portland cement dust may cause irritation to the eyes, skin and nose resulting in a sore throat and coughing. Acute symptoms include chronic bronchitis, wheezing and asthma. Studies show an increased risk in developing silicosis from long term exposure to respirable crystalline silica. Silicosis is a scarring of the lungs which reduces lung function and causes severe shortness of breath. Health and safety agencies have both recommended and required exposure limits to protect workers from over exposure to hazardous dust. OSHA has spent the past several years working to lower the permissible exposure limit of silica dust. The proposed rule would limit respirable crystalline silica exposure to 0.05 mg/m3 TWA ― a 50% reduction from the current 0.1 mg/m3 TWA limit. By lowering the PEL, OSHA is more closely following other health and safety organizations who already have low limit values for crystalline silica. While the pending rule is still undergoing review and comment period, employers should begin preparing now to implement silica dust control procedures. By implementing a source-capture engineering safety control using local exhaust ventilation, operators are at a reduced risk of inhaling hazard dust. 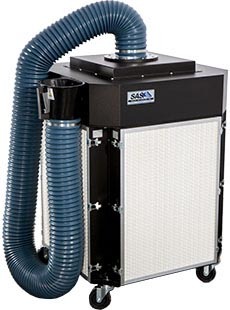 Sentry Air Systems manufactures fume extraction systems equipped with highly efficient filtration media that easily assimilate into most operations. Roll one of these portable units up to the test machine and position the flex arm exactly where you want to suction the airborne dust. Great for low to medium volume of concrete compression strength testing. Offers up to 700 CFM of air volume with a variable speed control setting. Uses only 2.5 amps – energy efficient! Single, Dual, and Quad arm configurations available. Great for medium to high volume of concrete compression strength testing. (4) Large MERV 16-rated Micro-Pleat Series 1 particulate filters – Cleanable filters! Offers up to 1,300 CFM of air volume with a variable speed control setting. Single and Dual arm configurations available. 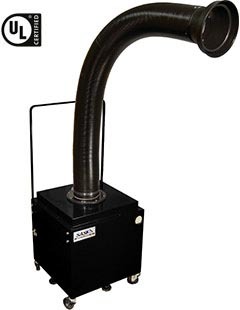 Industrial strength fume extraction for large-scale testing uses. The conceptual drawing below depicts a Model 500 fume extractor with (2) 5” diameter flex arms positioned against two compression-strength test machines to capture hazardous dust at the source of emission. For more information about controlling hazardous concrete dust, contact Sentry Air and speak with one of our applications specialists. Call 800.799.4609, email sales@sentryair.com, visit our website or fill out the feedback form below.